A story of misunderstanding and understanding. Of frustration and discovery. Of battling the elements, and making peace with them. But Ammi sees the monsoon rain approaching, and forbids Mina from going out to play. “…she (Ammi) has never felt that explosion of happiness when you score,” Mina tells little elephant. Nobody understands. Not Ammi, not the doodh wallah who tells her that rain helps trees and plants to grow. “Mina, this is a time to dance, and be happy,” he says. Mina takes matters in her own hands. And in so doing she discovers something—Ammi’s soccer jersey hidden away in a drawer. Ammi played soccer in her youth? 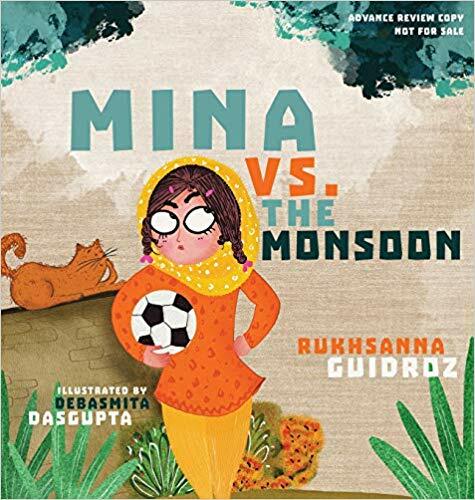 The sky may be grey and gloomy still, but now Mina understands that Ammi loves soccer too—this shared love a bond between mother and daughter that no rain can wash away. Beautiful illustrations depict India in all its glorious color. Kudos to the author-illustrator-publisher team for bringing out a book that breaks the stereotypical image of India as a land of snakecharmers and elephants, gods and goddesses, myriad festivals, and not much else besides. This is a book that belongs in all libraries, schools and book collections.